MARTIN, Joseph William, Jr., a Representative from Massachusetts; born in North Attleboro, Bristol County, Mass., November 3, 1884; attended the public schools and was graduated from North Attleboro High School in 1902; reporter on the Attleboro Sun and Providence Journal 1902-1908; publisher of the Evening Chronicle at North Attleboro since 1908 and also publisher of the Franklin (Mass.) Sentinel; member of the State house of representatives 1912-1914; served in the State senate 1914-1917; chairman of the Massachusetts Street Railway Investigating Commission in 1917; chairman of the Massachusetts legislative campaign committee in 1917; executive secretary of the Republican State committee 1922-1925; delegate to the Republican National Conventions in 1916, 1936, 1940, 1948, 1952, and 1956; permanent chairman of the Republican National Conventions in 1940, 1944, 1948, 1952, and 1956; member of the Republican National Committee, serving as chairman 1940-1942; elected as a Republican to the Sixty-ninth and to the twenty succeeding Congresses (March 4, 1925-January 3, 1967); minority leader in the Seventy-sixth, Seventy-seventh, Seventy-eighth, Seventy-ninth, Eighty-first, Eighty-second, Eighty-fourth, and Eighty-fifth Congresses; Speaker of the House of Representatives (Eightieth and Eighty-third Congresses); unsuccessful candidate for renomination in 1966; returned to North Attleboro, Mass. ; died in Hollywood, Fla., March 6, 1968; interment in Mount Hope Cemetery, North Attleboro, Mass. Papers: Speech (February 13, 1943) and letter (February 27, 1943). Finding aid in repository. Papers: Memorabilia and papers. Papers duplicates of those at Stonehill College. Oral History: May 12, 1966. Papers: 1911-1966. 110 feet and 103 scrapbooks (on microfilm). Personal and congressional papers and correspondence, including diaries (sparse entries, 1937-1955), photographs, portraits, video tape, sound recordings, and memorabilia. Finding aid in repository. Researchers are urged to contact college prior to visit. Oral History: Edward E. Martin, brother. August 1980. 120 pages. Interview deals primarily with Republican Conventions 1940-1956, dismissal of General MacArthur, and family matters. Hasenfus, William A. 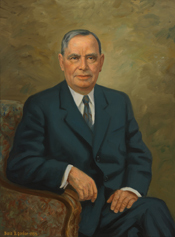 "Managing Partner: Joseph W. Martin, Jr., Republican Leader of the United States House of Representatives, 1939-1959." Ph.D. diss., Boston College, 1986. Kenneally, James J. "Black Republicans During the New Deal: The Role of Joseph W. Martin, Jr." Review of Politics 55 (Winter 1993): 117-39. Martin, Joseph William. My First Fifty Years in Politics, as told to Robert J. Donovon. New York: McGraw-Hill, 1960.